On May 31, 2010, Israeli soldiers boarded six humanitarian aid ships that were headed towards the Gaza Strip, carrying thousands of tons of supplies as well as hundreds of pro-Palestinian activists. The convoy, which was organized by the ‘Free Gaza Movement’, was intercepted by Israeli naval forces while attempting Israel and Gaza Humanitarian Convoy to break the naval blockade off the Gaza Stip. There were more than 10 people killed and several injured, including Israeli soldiers, during this incident. Statements regarding the events have differed greatly. The pro-Palestinian activists are reporting that the Israeli soldiers boarded the ship with no warning and began shooting sleeping civilians as soon as their feet hit the deck. Conversely, the Israel Ministry of Foreign Affairs issued a statement advising that Israeli naval forces boarded the ships after issuing several warnings that were ignored. Once on the ships, Israeli soldiers were attacked by the activists with live fire as well as other weapons such as knives and clubs. Britain: Protestors demonstrating against the Israeli attack attempted to storm the entrance of BBC, claiming that they were dissatisfied with BBC’s coverage of Israel. Greece: Several thousand protestors rallied outside the Israeli Embassy chanting “Free Palestine”. Police fired teargas in the crowd after having chunks of marble, stones and bottles thrown at them. Israel: During an anti-Israeli protest being held at a check point between the West Bank and Israel, an American student lost their eye after being shot in the face with a teargas canister. A national organization, the Muslim American Society, is calling for a “Week of Action” from May 31st through June 6th in response to the Israeli Attack on the Gaza humanitarian convoy. There have already been protests held in Los Angeles, New York and Washington D.C. in front of the White House. 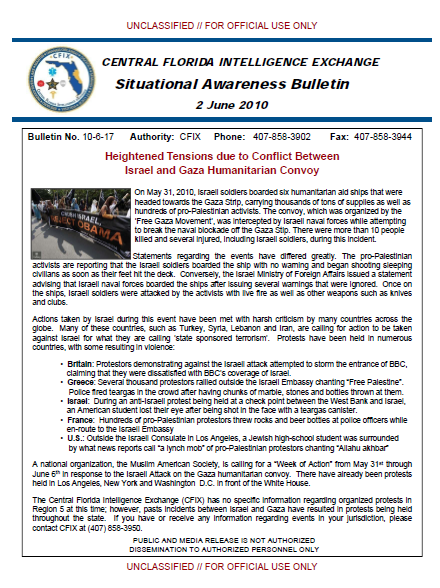 The Central Florida Intelligence Exchange (CFIX) has no specific information regarding organized protests in Region 5 at this time; however, pasts incidents between Israel and Gaza have resulted in protests being held throughout the state. If you have or receive any information regarding events in your jurisdiction, please contact CFIX at (407) 858-3950.